Bedding Information: 2 King. 2 Queen. 4 Twin. Incredibly beautiful ocean views make this charming “old Florida” style beach home right on the ocean, the perfect place to unwind. It may have old fashioned character but never fear, it also has all the modern conveniences needed for a perfect vacation. The high ceilings, antiques, twelve ceiling fans, heartpine floors, beaded board and paneled walls, rockers, gliders, porch swing, and hammocks all recall the lazy relaxing days of yesteryear. But this house is also equipped with wifi high-speed internet, widescreen TVs, a whirlpool bath, a modern kitchen, and air-conditioning. 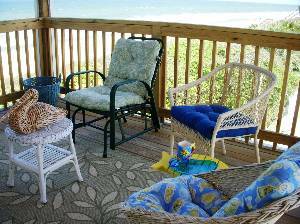 It’s located oceanfront at Vilano Beach near historic St. Augustine and has three decks and a large screened porch as well as nineteen oceanview windows and seven french doors overlooking the ocean so you can watch the lovely sunsets and sunrises inside or out. 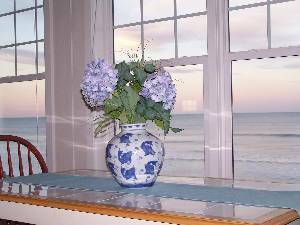 Both bedrooms and the sitting room on the third floor have amazing ocean views so you can see the ocean from your bed as you listen to the surf roll in. Or you can walk out on either of the two private decks and get a more personal birdseye view of the whole area. In the master bedroom, there is a king-size bed and a master bath with a sit-down shower and separate whirlpool tub (did I mention ocean views from here as well?). The bathroom is constructed from Italian travertine (as are all the bathrooms) and equipped with its own deck and ocean views. 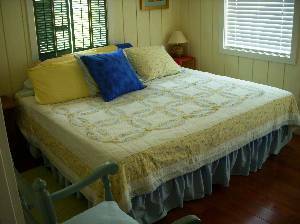 The guest bedroom has a queen-size bed and bath, and opens onto a separate large deck overlooking the ocean. 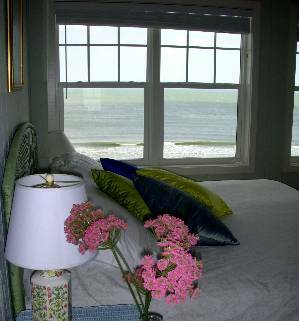 A sitting room adjoins the bedroom and bath, and has a daybed situated underneath windows with ocean views. 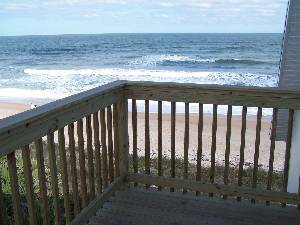 Because we are the highest home along this stretch of beach, there are unimpaired views in all directions. Interior and exterior stairs connect the third floor with the second. 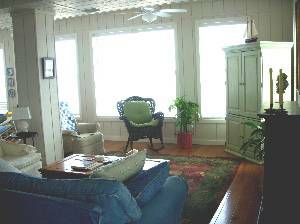 You enter the house on the second floor through a large screen porch where you can eat, sleep, and relax any time of the day. It has westerly as well as easterly views so guests can see the sunset and rise! French doors connect the porch to a large living room with heart pine floors, five ceiling fans, antique pieces and comfortable old rockers. Additionally, there is an electric fireplace to give the room warmth on blustery days. The kitchen and dining area open onto the living room, thus guests have panoramic ocean views. 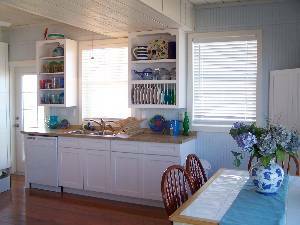 The kitchen is fully equipped with a pantry, refrigerator, range, microwave and dishwasher. The bedroom on this floor has a king-size bed, a deck with ocean views and its own private bath. There is also a laundry room and half bath on this floor. The first floor is a large studio apartment that faces onto a lovely patio with a porch swing. The studio has a queen size bed and two single beds and a sofa that makes into a queensize bed. There is a small kitchen and a full bathroom on this floor. We welcome friends and families with small children and have available for use: a crib, high chair, children’s table and chairs, a sandbox, and games, books and puzzles for all ages. Swimming, beach combing in front yard. Para-sailing, jetskiing, deepsea fishing, charter/rentals nearby. You can eat, sleep, or just relax on the screen porch. Wood floors, oriental rug, comfortable rockers, antiques, and views make this room wonderful! 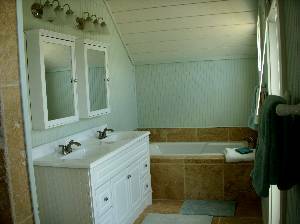 Master bath is built of Italian travertine and has a whirlpool tub, and sitdown shower both with ocean views and its own deck. Kingsize bed, private bath and deck for this rrom too! July 23, 2007 Reviewer: William R. Kochan From: Valley, AL. I searched many properties on-line for a rental that could accomodate our family of nine and this is the only one that could sleep all of us. Their price is quite reasonable for our family. The units-up and down-are very well furnished. The owners are very accomodating. We have rented this property three times and hope to rent it again in the future. HIGHLY RECOMMENDED! I stayed with my sister & her family in July, 2003. We had a wonderful time and I would highly recommend Pelican Point to anyone (large family, especially) who would like to have a great Florida vacation. Special Snowbird monthly rate for January and February, for the second floor is 3590 per month with the option to rent additional rooms as needed. Deposit: $500 security deposits reserves house. It is returned approximately 3 weeks after your departure if there is no damage or long distance calls. Cancellations and Refunds: Hurricane policy- we will refund prorated rental for any days lost due to hurricane evacuation of Vilano Beach. Written cancellation 60 days before arrival costs $50. Refunds for re-rented days on later cancellations. Other Fees: Cleaning fee is $150 for rentals less than 1 week. There is no additional fee for rentals 1 week or longer. Note the tax has gone up to 10% as of July 1, 2010. It is 9% until that date.